108 / the tasting panel / march 2015 N owadays when you think of Paso Robles, you think of red Bordeaux varieties—as well you should. Nearly 40% of the Paso Robles AVA's 32,000 acres of vineyards are planted to Cabernet Sauvignon; and where there is Cabernet Sauvignon, there is always the usual complement of Merlot, Cabernet Franc, Malbec and Petit Verdot—which totals up to more than half of all grapes grown in the AVA. 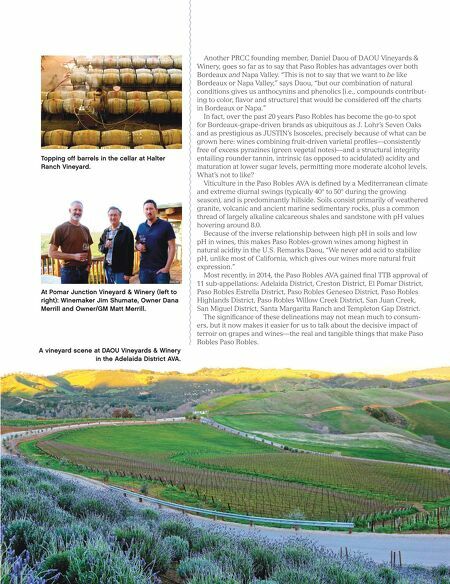 Much of the credit for Paso Robles' resurgent association with Cabernet Sauvignon is thanks to the Paso Robles CAB ("Cabernet and Bordeaux") Collective—or PRCC—founded in 2012. There are 26 PRCC winery members as of this date, benefitting from exchange of technical informa- tion, as well as a more aggressive effort to let the world know exactly why this 614,000-acre American Viticultural Area is ideal for black-skinned Bordeaux grapes. David Galzignato, Winemaker at Jada Vineyard & Winery, tells us, "Paso Robles is like a perfect storm for super-premium Bordeaux-style reds. We have soils like the soils of France, giving us texture and mineral complexi- ties, and a Mediterranean climate like Napa Valley, which gives us power- ful fruit expression." Damian Grindley, owner and winemaker at Brecon Estate. 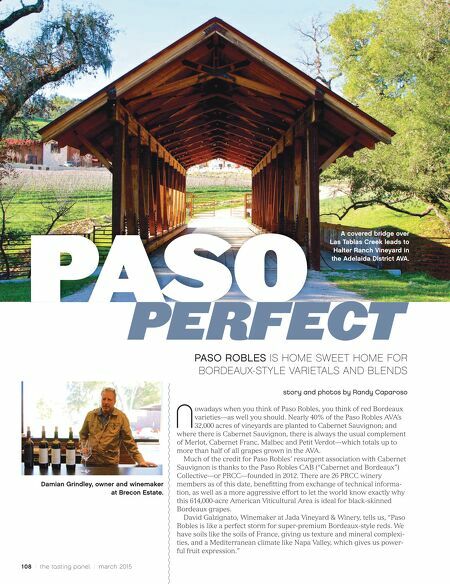 PASO ROBLES IS HOME SWEET HOME FOR BORDEAUX-STYLE VARIETALS AND BLENDS story and photos by Randy Caparoso PASO PERFECT A covered bridge over Las Tablas Creek leads to Halter Ranch Vineyard in the Adelaida District AVA.